Uneasy Peace. Worlds In Flux. Tests Of Faith. The Final Episode Was Only The Beginning. The Dominion War is over...or is it? Three months after the Allied victory against the invaders from the Gamma Quadrant, a surprise attack awakens the fear of renewed hostilities. At the same time, a senseless murder sets a space station commander on a path that will test the limits of her faith...while a strange discovery within the plasma storms of the Badlands propels an old soldier toward a rendezvous with destiny. Elsewhere, amidst the ruins of an ancient civilization, a young man is about to embark on a dangerous quest to fill the hole in his life -- one left by the loss of his father. So begins the unprecedented, authorized continuation of Star Trek: Deep Space Nine®, springing from the seven-year television odyssey of Captain Benjamin Sisko and his crew aboard a Federation starbase at the edge of the final frontier. Following the serial format and evolving character arcs that were the hallmarks of the TV series, the new Deep Space Nine novels pick up where the show left off, daring to imagine what happened after the final episode. Now the first five tales of that critically acclaimed storyline are collected in one massive volume. Originally published as the two-part Avatar, Abyss, Demons of Air and Darkness, and the novella "Horn and Ivory," Twist of Faith revisits the aftermath of the Dominion War, the pivotal planet Bajor, its mysterious connection to the timeless Prophets of the wormhole, as well as the familiar faces, new friends, and uncertain allies whose fates intertwine at the crossroads of the galaxy. 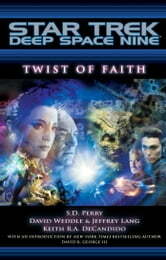 With an introduction by New York Times bestselling author David R. George III (Mission: Gamma -- Twilight; The Lost Era: Serpents Among the Ruins; the Crucible trilogy), Twist of Faith takes the Deep Space Nine saga to a new level...exploring what was left behind, and what awaits beyond.